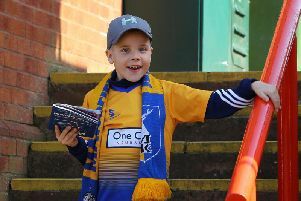 Adam Murray has told his Mansfield Town side they need to start being solid again and less gung-ho ahead of tomorrow night’s tough FA Cup replay at League One Oldham Athletic. Saturday’s 1-0 defeat Northampton Town saw the Stags go a fourth game without scoring and now boss Murray has said he intends to make tweaks to ensure his side go back to being hard to beat, while still being an attacking threat. He said: “Early season we were ultra-solid and never looked like we were going to lose. “At the same time we never looked like we were going to go and beat someone three or four nil. We switched that around and created a lot of chances and scored four on a couple of occasions, but now we’ve gone a little bit too much the other way and we are super-expansive. “We have had plaudits at both ends of the spectrum but it’s up to me now, the staff and players to get that balance so we are not ultra-defensive but at the same time we are not ultra-expansive. That is the new challenge. “But I am not going to go and make loads of stupid changes. We’ve just got to change the focus a little bit and maybe not go so gung-ho. You look at the amount of early goals we have conceded. That’s not through bad play. That’s because we have set out to win from minute one. He added: “After looking at the last couple of games and the way we are at the minute I think I am probably to blame in the sense that we are playing well and our performances are high. “I probably got carried away a bit with how good we are as a football team and I’ve taken the focus off being solid. “At the start of the season we took a bit of a rap off our supporters that we were not forward thinking enough. So we said we were going to take the chains off against Crawley, which we did. But what has happened is we have got caught up in it a little bit and at the minute we are too expansive. “I spoke to Chris Wilder after Saturday’s game and he said what a good team you are, very expansive and you play some good football don’t you? I am standing there thinking I don’t want to be expansive. I like the plaudits and the comments we got when people said we were organised, disciplined and hard to beat. Stags drew 0-0 at home to Oldham in the first game, the Latics going on to win 2-1 at Chesterfield in League One on Saturday. “We are going into an FA Cup game we are going to enjoy tomorrow,” said Murray. “It’s not part of our initial priority this season. That is to be successful and progress from where we were last season. “But it’s a game we want to win and maybe gives us an opportunity to look at a couple of things. But, even though it’s early in the season, we’ve got the biggest week ahead after that – not life or death, but if we want to stay in the top seven we’ve got to pick points up. “We need to get back on track. Take away tomorrow, tomorrow is a one-off game. It’s away from the priority. But then we go into a week with three games and we have got to put points on the board. On Saturday Oldham had to come from behind against Chesterfield and Murray said: “I watched the Chesterfield v Oldham game and I think across the country on Saturday the weather played a massive part. “We were probably fortunate we had one of the best pitches in the League which held up quite well. “But watching the Oldham game, the two goals Chesterfield conceded were keeper errors from the surface. One’s gone under him and one’s bounced off him and they’ve put it in. But they showed real fight second half and probably deserved the three points in the end. “We know what a good team Oldham are and we know going to their place has put the ball back in their court. But we are playing well. If we can get one to go in off someone’s so-and-so’s, then I think it will relieve a lot of tension within the group as we are gagging to score a goal. “We know there are goals in the team as we have scored goals and we are not far off scoring as many as the top teams in this league’s top three. “So it’s not a major crisis. We are just having a rough spell at the minute which every team will go through. It’s how we respond. “We have to take heed we have had a little bit of luck in staying in the mix when not picking up points. But that can’t carry on and we have a massive week ahead. Murray continued: “We went to Northampton and probably didn’t show them as much respect as we should have done. “We respected them in terms of knowing they were a very good team who have been together two years and know what it take to win the big games. “But we probably went there with an attitude that we just wanted to win and went there to win. We probably should have gone there with a bit more of let’s not get beaten. “It is a strange mindset to have, but I have done a lot of digging over the weekend and you look at teams like Plymouth, they play with two centre halves in midfield and their set up is ‘we are not going to lose’ and they are top of the league. “So we need to re-tweak a couple of things and go back to basics. But I can’t have a go at the boys or be too harsh on them as we are playing well. “Anybody who was at the game on Saturday will tell you it was a decent performance. Certain people in certain areas have got to be better. We know that and that will come. “Every team in the land will go through this period where they go through a sticky patch. We are having teething problems at the minute after 17 games which we probably expected after five. So it’s nothing we are worried about or shocked about.